Carpets give life to your office or home. They are decorative, adding beauty to your place. They are always exposed to dirt, dust and stains of all types. However, they are very expensive investment hence utmost care and professional maintenance should always be taken. Carpets should be cleaned at least twice a year to keep them sparkling and attractive all through. Cleaning carpets manually may be very cumbersome, ineffective and may give your carpet the old, dull, less attractive look. For high quality carpet cleaning service Hammersmith Fulham you can hire our cleaning company is a firm with highly experienced and skilled carpet cleaning experts. Our rug cleaners are adequate to meet your commercial or domestic needs. Also, we are available around the clock and you can reach us anytime. We clean all types of carpets. We use the dry and hot extraction method which is environmental friendly, safe to humans, simple and also very effective when washing carpets. This system usually removes all particles, soil, stains, germs, insects, and dirt even from the bottom carpet fibres where they tend to settle. Our cleaners are keen and experts in handling cleaning machines to ensure maximum care for your valuable carpet. You have many reasons to keep your carpet clean because we are reliable and we guarantee our services to assure your clean warranty and maximum satisfaction. 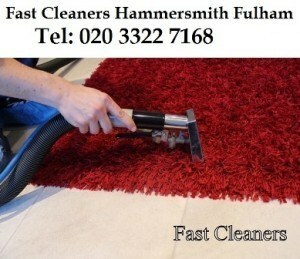 Fast Cleaners Hammersmith Fulham offers the best cleaning prices for high standard carpet cleaning in the industry. We add value to your aging carpet! Get more info on 020 3322 7168.